For years migrants have been experiencing difficulties in becoming legal especially in a country that they find refuge. Countries themselves face difficulties in regulation and accreditation of those migrants. People such as Jonas* who is a librarian, Rose* a school teacher and Spiwe a town planner and environmentalist, left their home country often not by choice but by circumstance. Being a foreigner in a country like South Africa highlights issues of xenophobia and discrimination which are constant struggles that have been and continue to be addressed in society. Who is a migrant, refugee or asylum seeker? According to the Department of Home Affairs spokesperson Mayihlome Tshwete, there is a diverse classification of migrants who come in and out of South Africa. Tshwete explains that there are temporary migrants such as tourists who are often here for short-term business or leisure. Migrants who seek temporary to permanent permits which would include the asylum seekers. 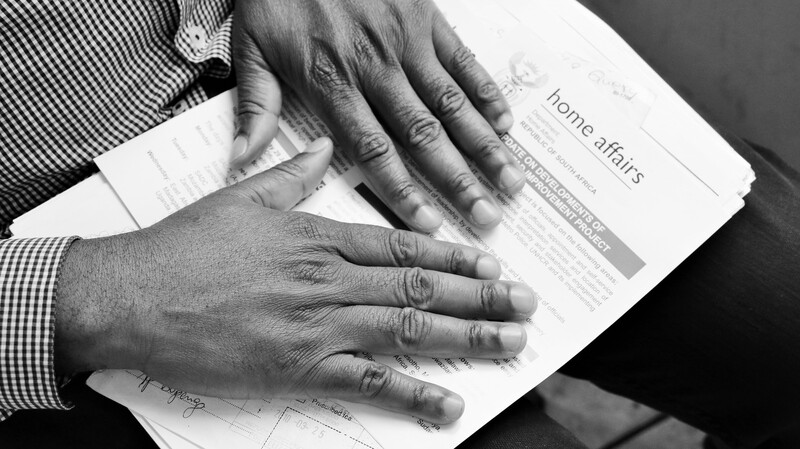 Within the refugee and migrant policies in South Africa there is different documentation that can authorise for foreigners to reside in SA, for example study and work permits, asylum papers, visitor’s visa and refugees status. “The role of the department is to live up to our constitutional requirements of providing protection to people who are fleeing persecution in their country or place of origin. Our responsibility as Home Affairs is to facilitate that and make sure that those people who are genuine asylum seekers get the necessary protection that they need from us, which starts with giving them documentation to be in the country,” said Tshwete. The migration of a population is a common practice in the world, often based on unfavourable conditions, such as internal migrants who leave home in the rural areas to look for work opportunities in the city. Internal migrants tend to be different from cross-broader migrants and the reasons for migration into South Africa are often based on political and economic reasons. The cross-broader migrants come from countries such as Mozambique, Zimbabwe, Botswana and Nigeria. The United Nations Convention definition of a refugee is someone who has fled their home country and has a fear of persecution for reasons of race, tribe, nationality, and political opinion, membership in a particular social group or religion. Rose arrived in South Africa fleeing during the night. “I didn’t have any passport when coming here. My husband and I left at night and travelled on the back of a truck,” said Rose. Jonas and Rose are both Zimbabweans who left their country because of the oppressive political instability or what Jonas describes as the “political crisis”. This can be disheartening to find oneself facing extra struggles in a place that is not familiar. “I am a recognised refugee in South Africa, which means I have gone through the asylum seeker route. I’ve been through interviews and re-interviews, appeals. I have really gone through a lot. In fact I have finished all the requirements of being a refugee,” said Jonas. However, the stress for him lies in the waiting for what will happen to his refugee status when his permit expires in March 2017. In terms of the South African Home Affairs refugee status applications and process, Jonas has been granted a number of extensions. “I don’t know, they are going to tell me, when it expires because my refugee status has been extended,” said Jonas. “Getting your papers in Johannesburg was impossible because they were only processed on Tuesday. Which meant that you have to sleepover from Sunday and Monday, and hope to be the top 40,” said Jonas. Rose got her permit as a migrant earlier this year, and says “to get my papers I would have to wake up early and leave at 3am just to be in Pretoria before 8am”. “Getting your papers in Johannesburg was impossible because they were only processed on Tuesday. Which meant that you have to sleepover from Sunday and Monday, and hope to be the top 40,” said Jonas. Rose got her permit as a migrant earlier this year, and says “to get my papers I would have to wake up early and leave at 3am just to be in Pretoria before 8am”. Migrants such as Jonas and Rose faced many struggles in becoming recognised in South Africa. They describe the Home Affairs offices as hostile for immigrants where they are told, “There is no war in Zimbabwe, so when you say you want to be a refugee you are a liar, you are an economic immigrant,” said Jonas. “I fought tooth and nail to get documented,” said Jonas. 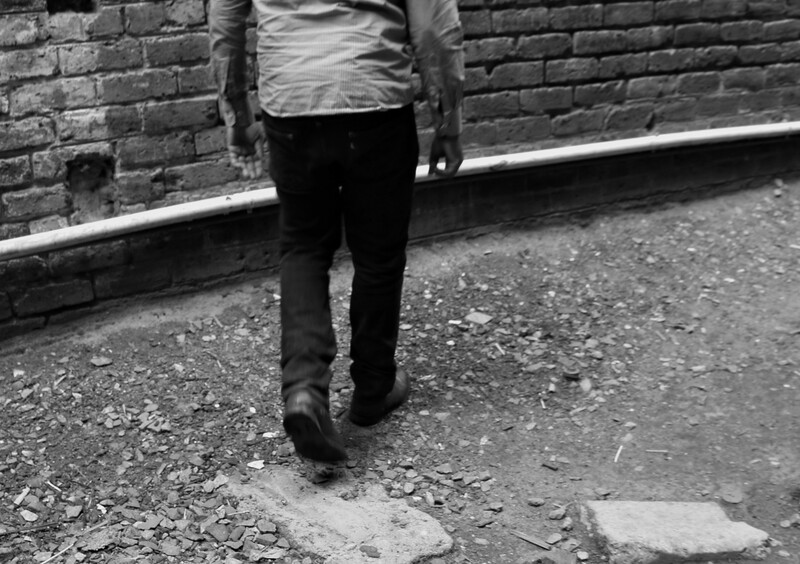 Arriving in South African in August 2004, Jonas said, “When I left my home coming here, if you asked me where I was going, I would tell you I don’t know.” When Jonas left his home town in Zimbabwe, Bulawayo, he left behind everything and everyone he knew. The refugee and migrant policies in South Africa have been under construction over the last couple of years following the increase of displaced people in Africa. Tshwete said that ideally the department would like to get paperwork for refugees and migrants done in three months, however, there are limitations that the office faces. “Given the amount of applications we have, it takes a lot longer than that; it can take up to two years in many cases. Not only because of our side, the volumes, it’s also because of the appeals that most of the applicants take when they are not given the refugee status,” said Tshwete. SKILLS: Refugees and asylum seekers have to fulfil standard requirements once allocated time. 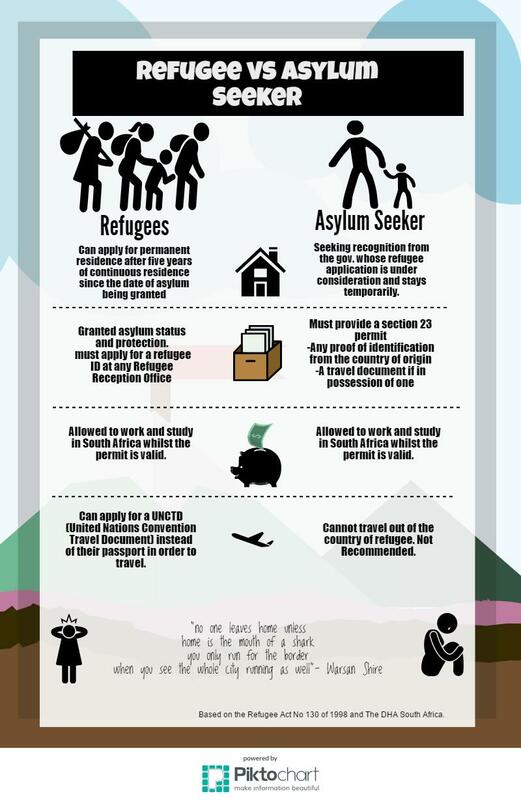 INFOGRAPHIC: A comparison between a refugee status applicant and an asylum seeker. ASSUMPTIONS: African refugees and migrants say they face discrimination in the Joburg CBD for being illegal in the country. Recently the Minister of Home Affairs Malusi Gigaba addressed the Regional Conference of the International Association of Refugee Law Judges in Pretoria, highlighting South African achievements and struggles in leading the development of a new policy on international migration and the management of refugees and asylum seekers. “South Africa currently hosts over 95 000 recognised refugees and last year received approximately 62 000 applications for asylum,” said Gigaba. An economic migrant is a person who travels from one country or area to another in order to improve their standard of living. Economic migrants are associated with low-skilled and unskilled work seekers, self employed persons, and small and micro entrepreneurs. Jonas expressed how he had often been referred to as an economic migrant. Both Jonas and Rose are currently working, and Rose says she is making enough money to rent a place for herself in the CBD. LEGALLY DOCUMENTED: “I fought tooth and nail to get documented,” said Jonas. Rose, who arrived as an asylum seeker has faced difficulties in receiving asylum papers, waiting for up to six months for the approvals. She said the frustrations were that the “requirements to get the papers were too much and somehow impossible to get”. The churches themselves, most notably the Catholic Archdiocese of Johannesburg and the Central Methodist Church, have made an effort to assist refugees and migrants in Johannesburg. According to Rose, “I arrived here in Johannesburg, Park station and the first place I was directed to was the Central Methodist Church in the CBD. The Central Methodist church has been a prominent place of refuge until 2015 when changes within the church structures resulted in the evacuation of all refugees and migrants. Jonas has also lived at the church and mentioned that he was mainly assisted by Bishop Paul Verryn of the Methodist church to get his permit. The Catholic Archdiocese of Johannesburg has a department of Pastoral Care for Migrants and Refugees. Sister Maria, the current coordinator of the programme was not willing to be interviewed by university students due to unfortunate previous experiences with student research. However, she said they issue pamphlets and host regular workshops to help migrants and refugees. During June 2016 the Catholic church held a Refugee Week highlighting the areas that the church assists refugees and migrants, through training, legal support and advocacy and liturgy or celebration and inter-religious spiritual support and networking. -Bank statements. “If you have a bank account you are fortunate because asylum seekers are not allowed to open account,” Rose explains. 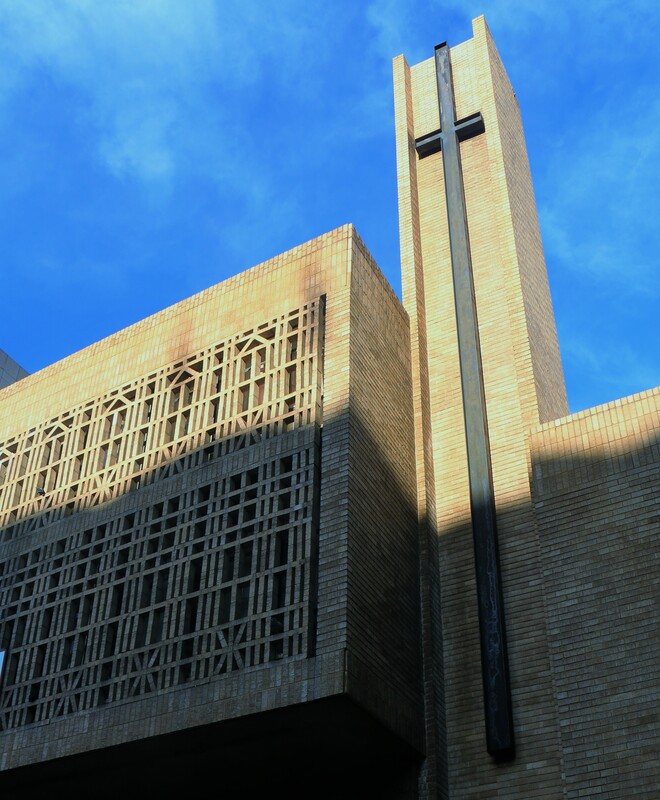 PRAISE AND WORSHIP: Churches such as the Central Methodist Church in the CBD have assisted in the spiritual and physical well-being of migrants and refugees. “It’s not obvious that when you apply you will get your permit,” said Rose. Spiwe arrived in South Africa in 2007 on a work permit, to work as a director in a government department. “…Now I have decided on studying at Wits and currently I hold a work and study permit,” said Spiwe. Her experiences of attaining a visa did not result in any struggle because she was brought into the country under critical skills, having applied at home in Zimbabwe. There are negative assumptions made about migrants, according to Spiwe. “What I have generally discovered is that South Africans don’t like foreigners, because the people that I used to work with actually say it.” She said working conditions were reasonable, however, racial and intellectual stereotypes arise while in the work space. These, she said, stemmed from corporate institutions paying for “corporate colour” and not qualifications. 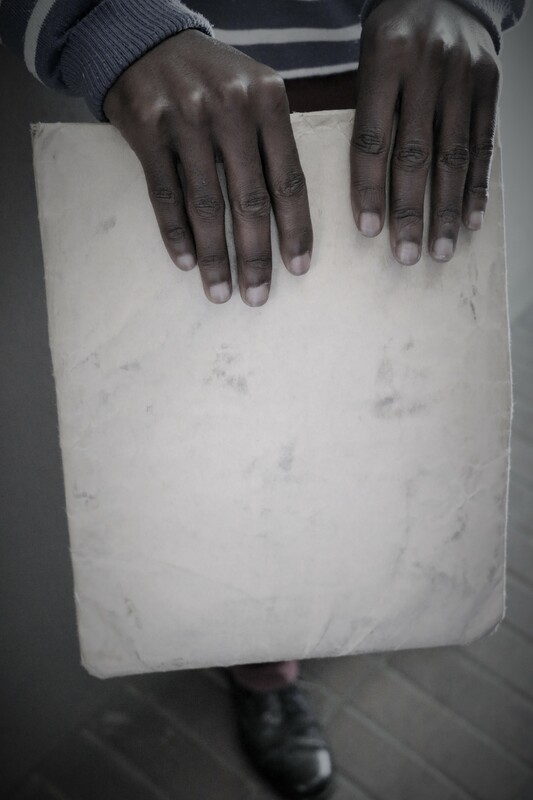 “I was surprised at how apartheid has finished but it has finished [only] on paper. “I find it surprising how I can be brought here into the country under critical skills and still be discriminated against. I mean what is the attitude for,” says Spiwe. Things that migrants would like for citizens to remember is that “I didn’t plan to come to South Africa,” said Rose. In response, Tshwete advised that he go to the Visa Facilitations Services, a company that facilitates or rather connects all the documentations. All around the world the movement of migrants and refugees has been become a painful sight to witness especially when people escape deadly situations as in Syria, Ethiopia and Nigeria. Institutions such as the Department of Home Affairs, the office of the United Nations High Commissioner for Refugees and the churches play a significant role in assisting migrants and refugees with permits and legalities. The degradation that refugees and migrants experience in 2016 highlights how each one of us has a lot of work to do when it comes to making the next person feel a part of humanity. All around the world the movement of migrants and refugees has been become a painful sight to witness especially when people escape deadly situations as in Syria, Ethiopia and Nigeria. Institutions such as the Department of Home Affairs, the office of the United Nations High Commissioner for Refugees and the churches play a significant role in assisting migrants and refugees with permits and legalities. The degradation that refugees and migrants experience in 2016 highlights how each one of us has a lot of work to do when it comes to making the next person feel a part of humanity.